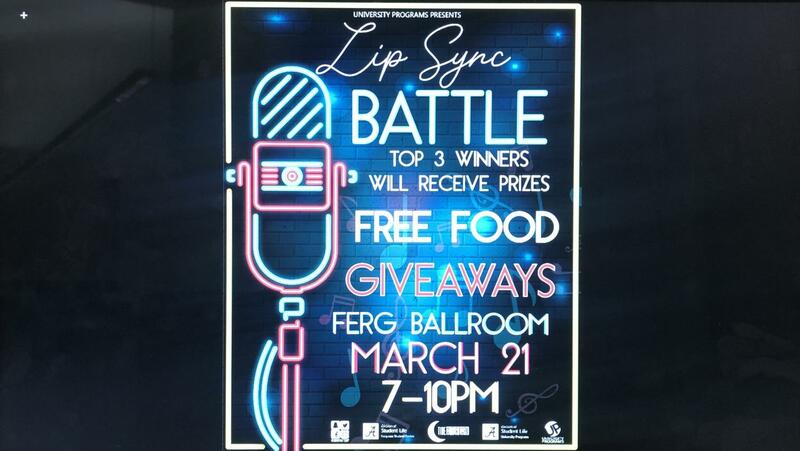 Shemaiah Kenon, events coordinator for University Programs, said the lip sync battle will be modeled behind the television show, so students will be able to perform in groups or individually to their favorite songs. Who: All students can attend. When: Thursday, March 21 from 7-10 p.m.
Kenon said students can come by and grab some food, hang out with their friends and sing and dance with their friends. Kenon said for students that want to participate, they can sign up at the event while checking in. After that, participants will be able to choose what song they want to perform and perform in that order. Kenon said in addition to the usual University Programs accommodations, such as food and drinks, students will get the chance to win raffles, giveaways and other fun prizes. “We are really looking forward to students being able just to come out and really have fun,” Kenon said.